What harm does idling do? First, idling pollutes the air and harms health. 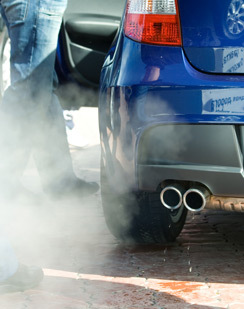 Idling tailpipes spew out the same pollutants that form unhealthy smog and soot as those from moving cars. Nitrogen oxide, particulate matter, carbon monoxide and volatile organic compounds are the main health-harming pollutants in vehicle emissions. Diesel engines emit more than 40 hazardous air pollutants.